After an epic drought year, the pendulum has swung completely the other direction here on the West Coast. Forecasters are saying this could be the worst storm to hit the Western United States in 5 years and are calling the torrential downpour the Pineapple Express or Rainageddon. Although it didn’t hit us as hard as predicted, our Northern and Southern neighbors were pummeled. We were all talking here at the shop and realized, many of us aren’t as prepared as we could be. Everyone hears how important is it to be prepared, but how seriously do you take it? Do you have a plan? Having stored food and water is a priority for survival but what about staying informed when all communication is down? Your local radio stations are the most likely sources of up to the minute information on what’s happening. This is why the CC Solar Observer was built. After the big earthquakes here in 1992, Bob wanted to make sure we had a small, portable radio that worked if the power was out and it had to have weather so listeners could receive NOAA updates. Everyone thinks these days, “I have a cell phone” but what happens when you’re without power for an extended period of time and have no way to charge your phone? You say, “I’ll use my car”, but we talked to several customer during Hurricane Sandy whose cars were inaccessible because they were under water or destroyed. Or what if the cell towers are jammed or wiped out? Your cell phone will be useless and where does that leave you? Hurricane Sandy in 2012 left 1.3 Million Americans without power, some for up to two weeks. People traveled miles seeking power sources to charge their devices to call loved ones and get updated power recovery information. Being prepared with not only food and water but with a battery operated radio, flashlight and extra batteries will be your safety net and lifeline. You may not know, but a radio with an active NOAA Weather Alert feature can alert you up to 30 minutes prior to a major storm. That’s enough time to gather what you need and hurry to shelter or to at least get out the flashlights and shut the windows. 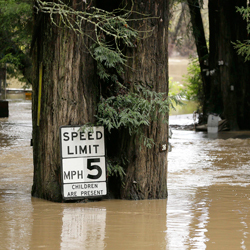 Here are some tips for safety and to help get you better prepared for the big storm. Create a preparedness kit that will last 72 hours for each person in your household. Include in your kit- canned food, bottled water, battery operated radio, flashlights, batteries, blankets, clothing and shoes, first aid kit, money (make sure it’s cash – ATMS need power too), Rain gear and specialty items such as medications, infant food and pet food. Stay home and off the roads if appropriate. Bob’s tip for potable water – A good source for drinking water in your home is your hot water heater. It can provide you with much needed clean drinking water when your local water services have been disrupted. You should filter the water to remove any contaminates present. You can drain the water using the valve on the bottom of the tank. Be sure to turn the gas or electric supply to the water heater off before draining it. No matter what the emergency whether it’s snowstorms, floods, hurricanes, fires, landslides or earthquakes or natural disaster – We encourage you to check your kit and plan and if you don’t have one make one. Below are some additional links to local images and new coverage from our recent storms and predictions for some more.